Fife AC is one of the more enterprising clubs in Scotland with a whole host of races organised around the County – names like the Strathmiglo Straddle, The Gauldry Gallop are well known to athletes from around the country. They have teams in all the leagues in the country as well as travelling south of the border for competition. A comparatively young club they are however best known for the quality of runners who represent them. The names will appear in the following profile by Colin Youngson who has run with and against almost all of them. A few of the very good athletes who ran for Fife AC have been profiled already on this website. Donald Macgregor, Terry Mitchell and Paul Kenney. We have also added Andrew Lemoncello (who was coacjed by Ron Morrison) to this group. The new club had gained momentum after Donald Macgregor left Edinburgh Southern Harriers in 1975. Fife won the most meritorious medals in the 1976 Edinburgh to Glasgow (sixth place) and for the next thirteen years had a few top ten performances, including another sixth in 1982. Although Fife AC has always had excellent team spirit, (as is obvious if you read ‘Relay’, the club magazine) a certain lack of top end speed limited success in the Edinburgh to Glasgow. Donald Macgregor whose finiest performance was seventh in the Munich Olympic Marathon, and who was a world veteran champion (over 10000m and the marathon) was influential in encouraging his clubmates to try longer distances, and five of them emulated him by winning the City of Dundee Marathon: Murray McNaught, Terry Mitchell, Sam Graves, Stuart Asher and Hugh MacKay. Of these, Hugh was definitely fast on the track with times of 1:62.20 (800m) and 3:48.3 (1500m). Terry was a very strong international runner. Alan McIntosh (East District steeplechase champion in 1976 and 1977) was second fastest on Stage Three in 1978 and Stuart Asher was fastest on Three in 1984. Yet Fife’s best years were to be from the decade from the mid-1990’s and apart from Lemoncello, their most talented runner was Daniel Leggate, a;though he had several especially good team-mates, including Sandy Moss (who won the 1996 Inverness Half Marathon). in the Edinburgh to Glasgow Relay, after a year out of the race, Fife finished twelfth in 1995, despite a good start by Terry Mitchell. There was a definite improvement in 1996 when they were nonth and Daniel Leggate made his debit on Stage Two moving up three places to sixth with a time less than thirty seconds slower than his fastest opponent. Sandy Moss also gained three positions on Stage Three but that was the high point. In 1997 Fife may have ended up fifth but in fact were only one good runner short of the medals. Moss and Leggate were once again amongst the strongest performers. Sandy moving up three on Stage Five with the second fastest time, and Daniel gaining one more on Stage Six, fifth fastest. Finally in 1998, Fife AC gained deserved bronze medals. This time they got the team order absolutely right. John Cunningham did very well to come in second on Stage One. After 1997 Scottish National Youth Junior Cross-Country Champion Jon Stewart (based in Halifax), Kevin McCue and Owen Greene slid back a little to sixth at the end of Stage Four, Terry Mitchell, Daniel Leggate (narrowly second- fastest to Phil Mowbray on Six) and Hugh MacKay each gained one place and Sandy Moss did very well to fight off Cambuslang and secure third. There after it was seventh in 199 and fifth in 2000 (with Cunningham second on Stage One and Leggate third fastest on Six). The final two versions of the E-G tended towards Chaos due to the ill-advised option of a complex and badly marshalled off-road route. In 2001, Fife were penalised two minutes due to “an unintentional cutting of the course on leg 7” and were deemed to have finished seventh. This seems harsh since Ala Milligan (a Scottish hill-running international) who ran that stage, was one of their best athletes and his time, minus two minutes, seemed to be what he would normally have run. Without the penalty they would have finished fourth. The final E-G in 2002 produced another farce. Fife were in ninth position when Daniel Leggate took the baton on Stage Six. Somehow he and three other runners went off course. He was forced to run for at least an extra fifteen minutes and handed over in sixteenth. His club was later to be declared non-counting. Daniel Leggate won a gold medal as the first individual in the 1995 National Junior Cross-Country. In this championship, between this year and 2004 Fife AC wone one team gold medal, four silver medals and two bronze medals. In 1996 future Fife athlete Alan MiIlligan (running for FMC Carnegie Harriers) was Junior Champion. Daniel’s best performances in the Senior National were fifth in 2000, eleventh in 2001 and third in 2003. Sandy Moss (third in the 1998 East District Cross-Country) was seventeenth in 1997 and thirteenth on 2000. Alan MiIlligan finished tenth in 2000. Owen Greene (another British International hill-runner) was seventh on 2002. Fife AC won two team bronze awards – in 2000 (Leggate, Milligan, Moss, Cunningham, David Adam and Adrian Davis_ and 2003 (Lemoncello third, Andrew Liston twelfth, Greene, Leggate, Christopher Russell and Adrian Davis. They won silver medals in the Scottish Six Stage Road Relay in 2000 with Scott Taylor, Terry Mitchell, Alan Milligan, Daniel Leggate, Owen Greene and John Cunningham. Colin’s club profile finishes there and he does well to highlight the shambles of the final two Edinburgh – Glasgow Relays – there is a school of thought that they should not be recognised as proper E – G’s since they were not on the road and there were too many catastrophes (major and minor) in each of them. 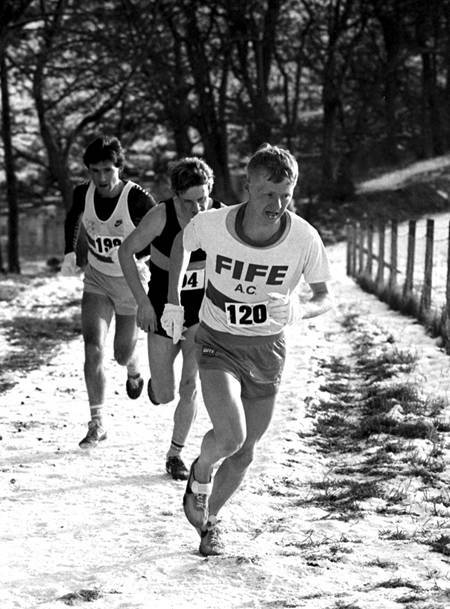 I knew several of the Fife runners – Sandy Moss was coached at one time by Frank Horwill, founder of the British Milers Club and who called him Alex Moss. He also trained frequently with our group when he was at University in Glasgow and was indeed a talented distance runner. John ‘Cowboy’ Cunningham was a real tough guy who had quite a lot of ability and was a very good steeplechaser who was at one time on the very verge of international selection. They were indeed worthy members of any fast pack.